I first got word of Seth Grahame-Smith’s upcoming Pride and Prejudice and Zombies, an adaptation of Jane Austen’s Pride and Prejudice by way of the zombie horror genre “with all-new scenes of bone-crunching zombie action” a few weeks ago. I squinted my eyes, considering. Ultimately, I ignored it, I moved on. But since blog posts and news articles about this novel have been relentlessly appearing in my Google Reader, it seems others are not doing the same. 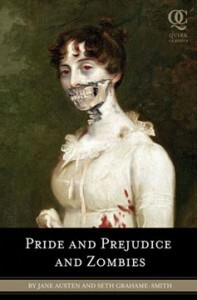 So, a zombie monster adaptation of Jane Austen’s Pride and Prejudice? Is this literary sacrilege? Unlike my mother who rereads the novel every year, I’ve never been a fervent admirer of Jane Austen–as a young reader, I would have much more cheerfully welcomed a Bertha Mason or two in the attic before the news that Wickham is, in fact, the scoundrel rather than aloof Mr. Darcy. Still, it is a fine story. And since I am neither an enemy nor a kool-aid drinker of Austen’s work, I’d consider myself fairly capable examining the appropriateness of its zombification. Pride and Prejudice and Zombies is considered satire, and well-done satire is necessary and enlightening. But there is a fine line between Onion-like wit and Jane-Austen-Book-Club-type literary kitsch (for the record, that fine line is intelligence), and for two glaring reasons I’ve gleaned solely from title, I’m not convinced Grahame-Smith’s adaptation will be sensitive enough to traverse it. First of all, why Pride and Prejudice? With all the filmic adaptations and off-shoots, hasn’t the poor classic been through enough? And won’t this make it much more difficult to pull off? After all, I’m still reeling from Bridget Jones: the Edge of Reason (not satirical, but still). The second faux-pas is his chosen breed of monster. Because the zombie trend–especially the funny zombie trend–is passed. Shaun of the Dead was released in 2004, and successfully foiling the tediousness of the zombie monster with the subtlety of dry British humor is not something I imagine easily accomplished. Satirical zombies may, frankly, never be seen the same again. And that’s a good thing. To be fair, zombies would not be the worst choice Grahame-Smith could have made. Vampires, of course and unfortunately, are out of the question as long we want the Twilight fetish to continue to fade. But what about werewolves? Mummies? The Blob? Frankenstein’s monster, even, would forge an intriguing literary blend. In his review of Shaun of the Dead, Roger Ebert wrote “as…characters, zombies are boring by definition: All they can do is shuffle, moan, catch up with much faster people, and chew on their arms.” As I see it, the same goes for literary kitsch. Definitively unentertaining, these books are empty and theme-less. Agonizingly, they are the ones that never go away.